I take a circuit class after work on Tuesdays so our evening meal is usually a quick affair based on what is hanging around the fridge and is something I can get onto the plate as quickly as possible. I thought I’d start an occasional series of top quick ideas to hopefully give others who are crunched for time some ideas for speedy meals. I came home to a pot of mushrooms, one leek, half a bag of spinach and an almost brown bag of basil. This immediately screamed pasta to me so I got the water on to boil while I decided what to do with the rest of it. I fried the leek and mushrooms in olive oil with a bit of garlic. Then I blitzed the spinach and basil in the food processor and added a splash of water and olive oil to make a sort of pesto sauce. I threw a chopped italian sausage into the leeks and mushrooms, just because it was hanging around the fridge, but you could probably manage without it. I drained the pasta, tossed the pesto and leek and mushroom mix into it, and finally stirred in some grated Tofutti cheese which also needed using. 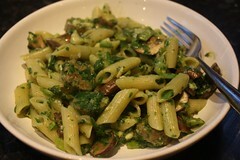 This meal was on my table in the time it took to cook the pasta, and was filling, hearty and delicious. A Top Quick Tuesday indeed. This entry was posted in Top Quick Tuesday by efcliz. Bookmark the permalink. That sounds like a delicious quick meal. Keep the suggestions coming, whilst I do have plenty of cooking time most days I’m always forgetting to make anything until I’m starving & then I just end up eating pitta & hummus! Haha I’m with Jojo – so very often I have such good intentions and I end up getting too hungry and eating pitta and humous! This meal looks delish, keep the speedy ideas coming! Thanks!